I always used white, or white; chartruse, but watching Major League fishing Finals; ,Suggs (who won) was using a green pumpkin color. I also see Barlow's has black chatterbait blades. Just wondering what colors you guys have had success with. This is funny you should ask that, a buddy of mine called and asked me if I ever made black and blue bladed swim jigs and when I thought about it I can't remember ever doing that color. 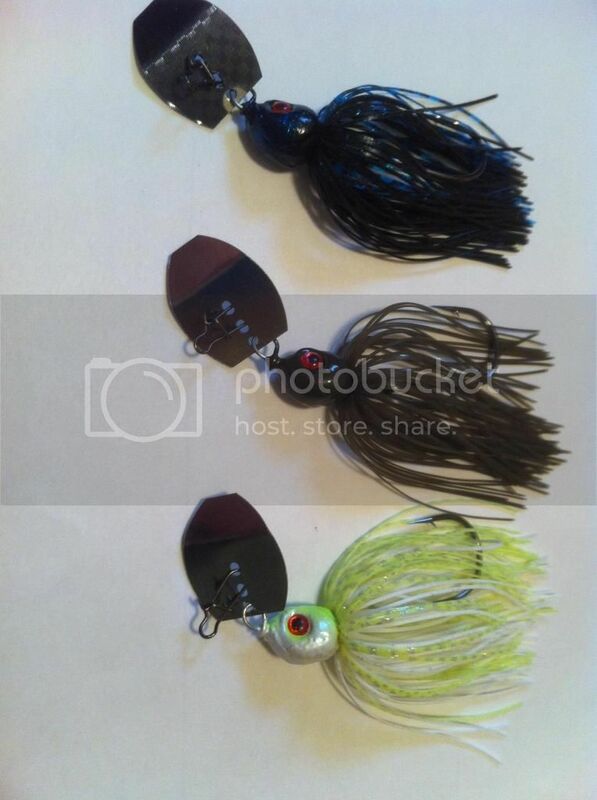 What is worse is that most of the colors I do are baitfish or bluegill imitatiors, the closest I've come to green pumpkin is my green gill color which is watermelon with a powder blue accent, the name of the skirt material is molting craw. I did well last year with a bladed jig using the molting craw that smalljaw stated. Also did good with a Okeechobee craw color. We do well with GP smokin shad on a chatter bait. Anyone use black chatter blades? Sounds like I need to get another skirt tab order ready! Yes to the painted blades. Yes, Yes, Yes!!! In fact I don't use unpainted much anymore. When the whole chatterbait craze hit I fished them on a couple clear lakes in northern WI and they were ho-hum at best. But I could see that blade flashing all the way back to the boat and I thought maybe it was too much. So I powder painted some black and some watermelon blades and it was night and day in clear water. I probably increased my catch X6 by getting rid of the flash. Recently I have done Smoke powder paint and those blend well with most jigs. I use almost all dark colors. Its kind of a non-committal dark color. I have tried cutting some out of clear lexan and it's not strong enough. Clear would be the "bomb"! Thanks for ,the information. I have only fished the silver blades with white or chartruse skirts, seems I have a lot of new testing to do! Wow, I'm going to try this on my musky sized ones as I most often fish clear water and have only had spotty success with them. I make an all black chatterbait. In muddy water or dark cloudy days it works pretty good. I take the blade and sand it and then powder coat it black. Seems to stay on better. The other thing I like to do with them is I make the skirt like you would a jig but I take four strands and run them about two inches past that. Those four strands will dance like crazy and I think get you an extra bite or two. I'm really liking this discussion. First time I ever tossed a chatter bait was last summer and fell in love with it. A friend made a few for me and now I'm hooked. Is their a head design that works better for a chatterbait than another? I just use an Arkie and took my grinder notched the eye out so I could put the right hook in. I also use a shaky head football mold on my heaver chatterbaits. The hook eye is already in the right direction on that mold. With that mold I make 1/2 oz with a 6/0 hook and put a 3 or 4 inch swim bait on the back of it. The heavy weight lets you run it fast and keeps it from flipping or running on its side. It's a great bait in the fall when they are feeding up on shad. I use the swim jig (casting jig) for my chatter style baits because the 30 degree hook seems easier to heat and open for making them. Just a few colors I like to throw. I love the poison tail mold because of the versatility. I can make chatterbaits, jigs, spinnerbaits and swimbait heads all from one mold.